The people of' Port Huron, Michigan and Sarnia, Ontario, cities facing one another across the St. Clair River, endured the putrid smell of fermenting grain for weeks in 1911 after the grain freighter City of Genoa was partly sunk in a collision. Fog was blamed for the crash that sent the wooden hulled steamer to the bottom in 50 feet of water at about 5 a.m. on Aug. 26. The City of Genoa was on the river at about 4 a.m., steaming down bound with 125,000 bushels of' wheat and corn in its holds, when it encountered a blanket of fog. Capt. George T, Inman dropped a bow anchor in mid-stream, about 100 feet off the Sarnia waterfront. He planned to wait until the morning sun burned away the haze. The ship swung around in the current so its bow was turned upstream. Luckily, the Genoa only sank to its decks and remained upright. Crew members waited in the pilot house until the Gilbert turned around and picked them up. The Gilbert, which had Barge No. 127 in tow, was damaged in the crash but the ship did not sink. 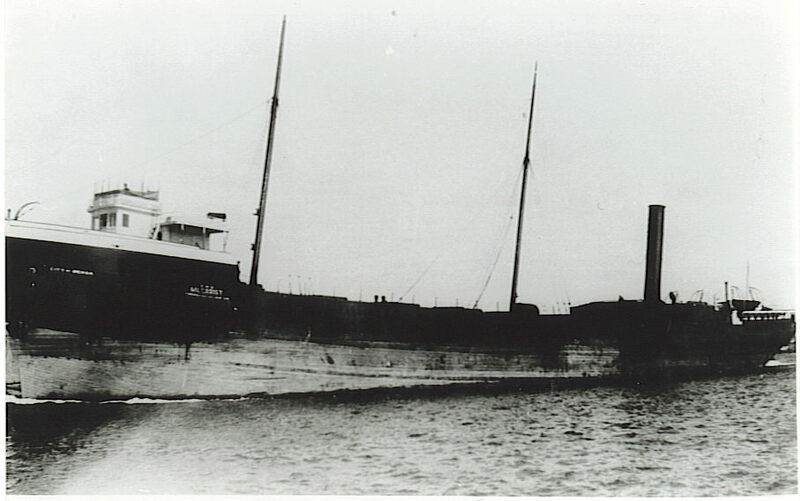 The City of Genoa remained sunk for several weeks, with only its pilot house and stack showing, until Sarnia salvager Tom Reid built a cofferdam around the hull and raised the wreck. The ship was so badly damaged it was declared a total loss. Its water soaked grain cargo was already fermenting but an effort was made to salvage it anyway. The wreck was towed downstream to the Reid Wrecking Company dock where the grain was unloaded and spread out to dry. The smell of the fermented wheat and corn was strong and the stench caused a general fervor among residents on both sides of the river, The newspapers remarked almost daily about the terrible odors coining from Tom Reid's dock. The engines and boilers of the Genoa were removed and the wooden ship was burned at Sarnia on Oct. 9, 1915. The blackened hull was one of the many abandoned wrecks from Reid's business that were towed out on Lake Huron and sunk. The ship lies with other wrecks of the Sarnia "Ghost Fleet" in about 80 feet of water at the southern end of the lake.